While I was back in Ohio for just one day, Aleisha and I decided we had to do a joint craft while I was there. How could we not!? 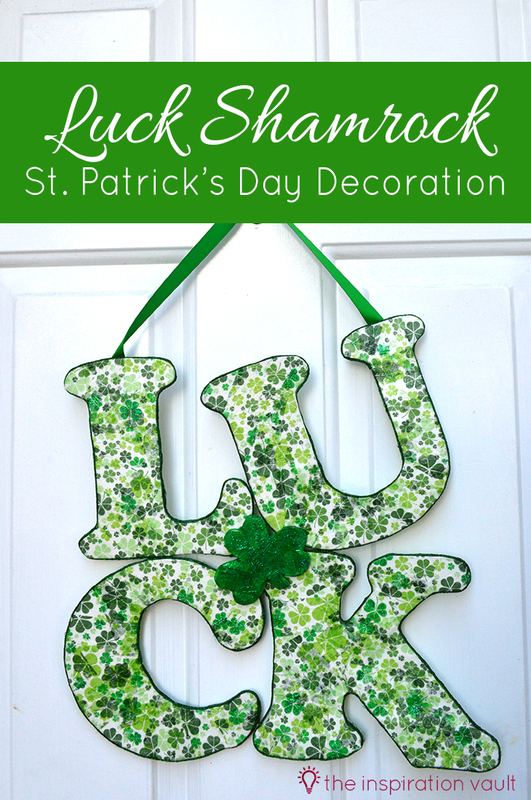 We settled on a Luck Shamrock Decoration craft for St. Patrick’s Day. I’d love to have more decorations for that holiday and I’ve been dying to try decoupage for the longest time. Yes, I said it, try decoupage. In all of my years of crafting, I had never actually tried it before now. It was a hilarious learning process, but overall, I had fun making this project and definitely learned some Do’s and Dont’s along the way. 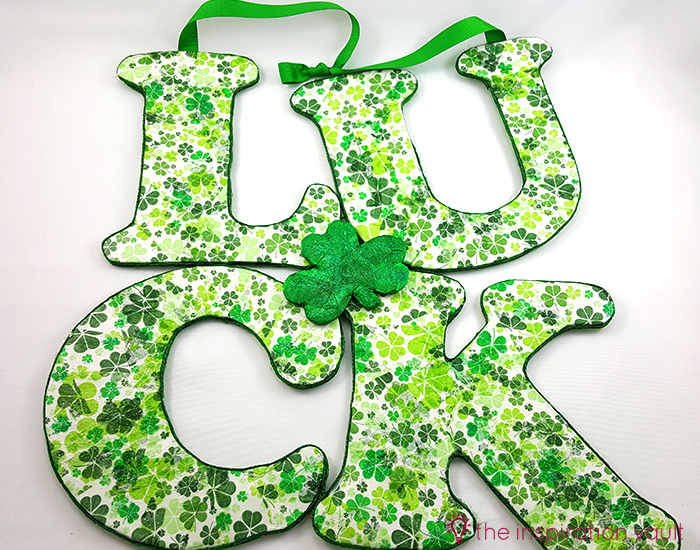 I found the shamrock napkins, foam board, green ribbon, and green jute cord all at Dollar Tree. I had everything else on hand, but those items are easy to find at any craft store. 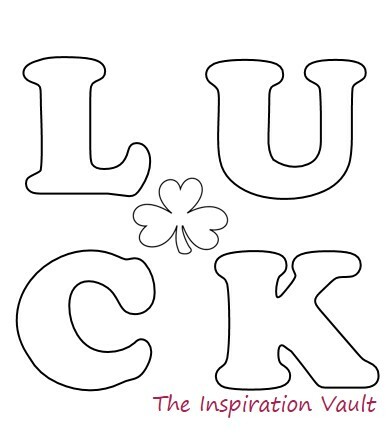 one: Either use the Letter PDF (click image below) to print and cut out the letters L U C K, or use your Cricut with the Cooper Black font, letters set to 7.5 inches tall. 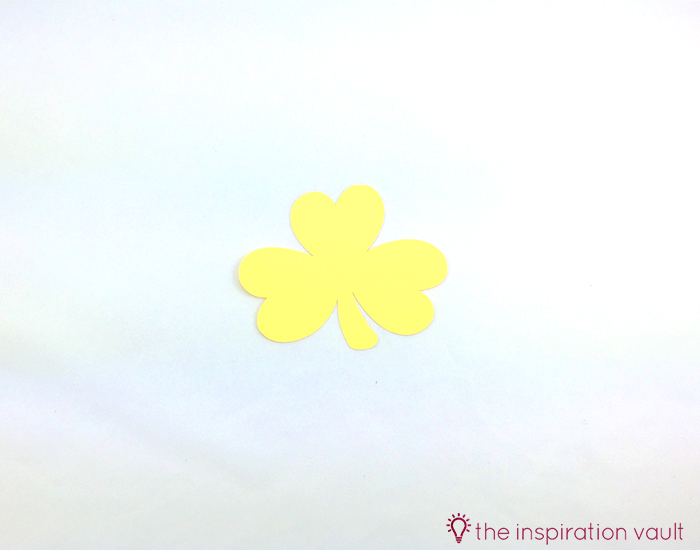 two: Either use the PDF to print and cut the shamrock or use your Cricut and upload this Shamrock SVG image. For the SVG, you want it to be about four inches wide. 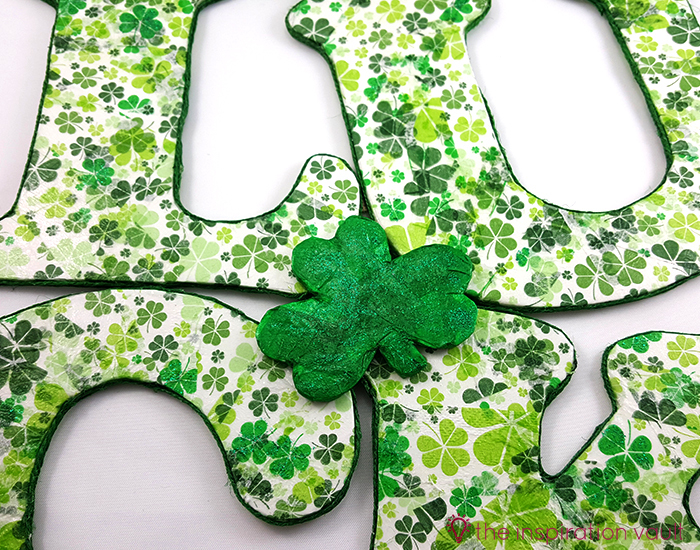 three: Use the cutouts as a stencil to trace all the letter and shamrock shapes onto the foam board. 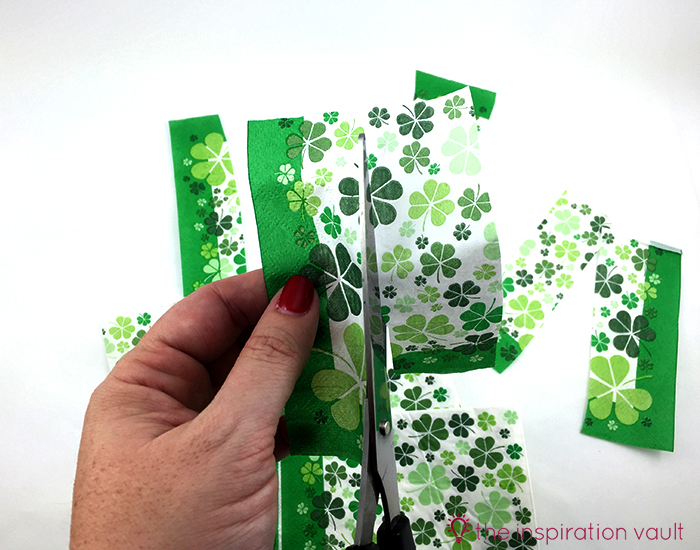 four: Use the box cutter to cut out the letters and the shamrock. 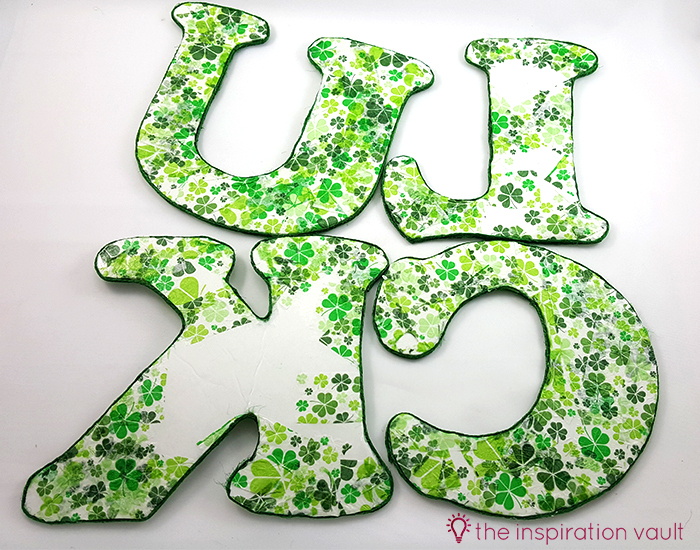 five: Cut some napkins into big pieces and decoupage them onto the foam board letters with the Mod Podge. Let then dry completely. Try to dry them on a surface they won’t stick to and also so they won’t bend. 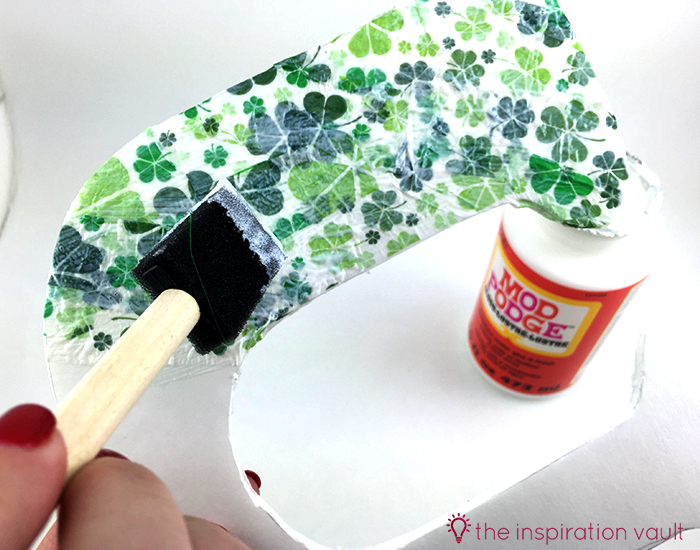 If you like your crafts to look nice on both sides, decoupage both sides and dry carefully. 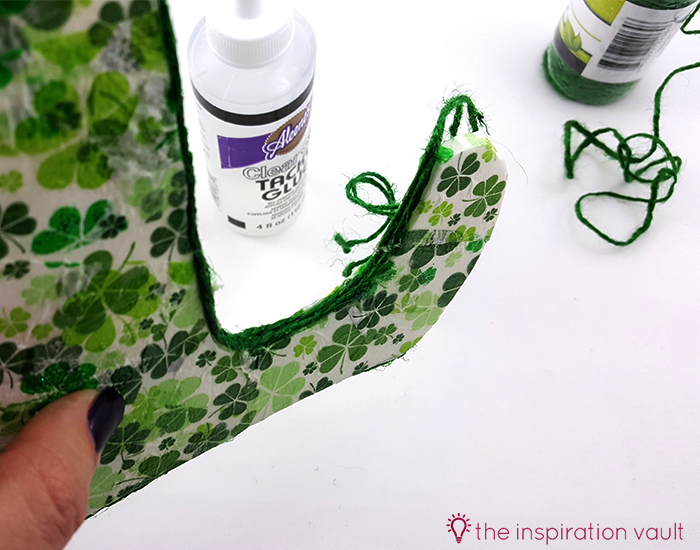 DO: Decoupage on a surface that can get glue on it. This might get messy! 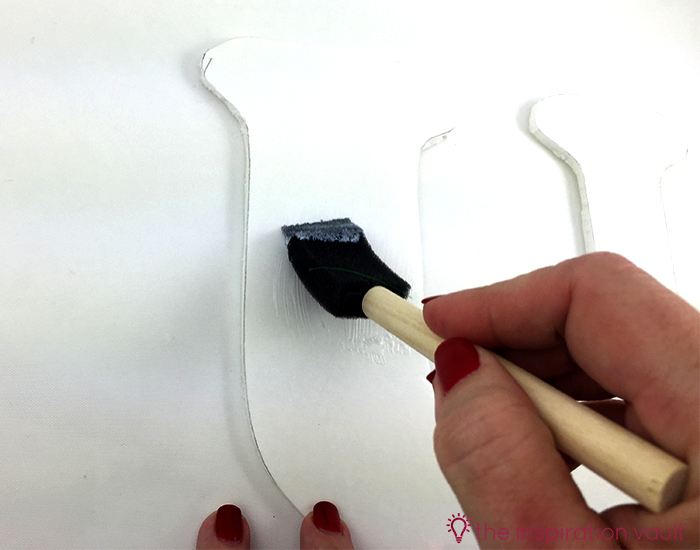 DON’T: Lean them against anything to dry—they will curve. 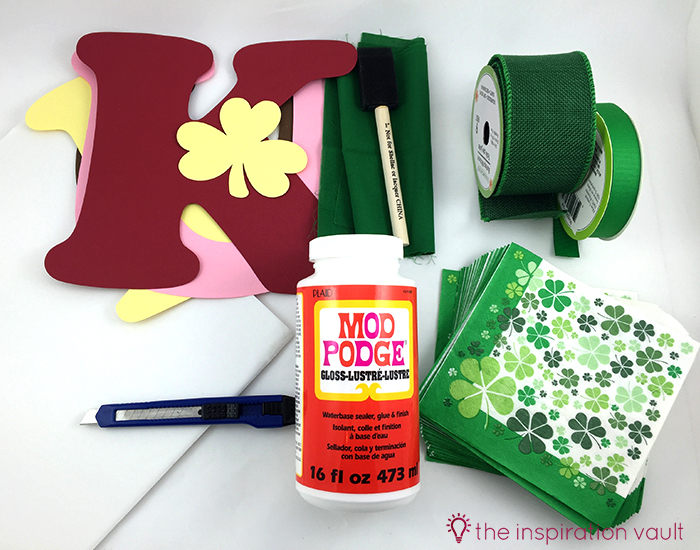 six: Cut the green tissue paper into small strips and decoupage them onto the shamrock with Mod Podge. Let it dry completely. 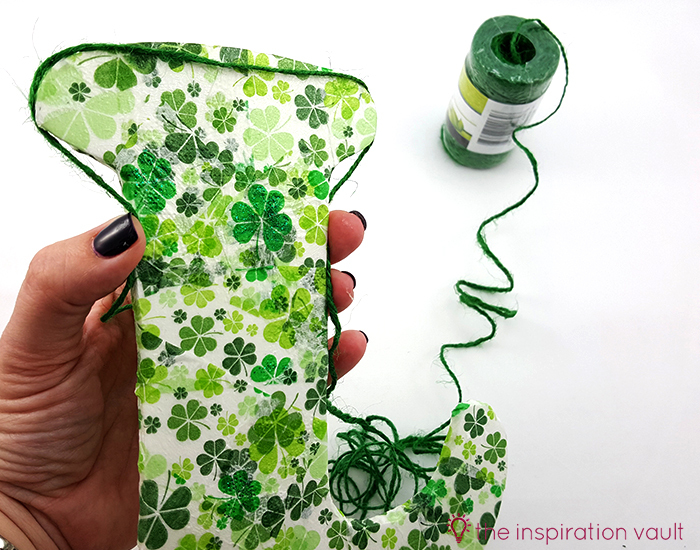 seven: Use green glitter glue or mix green glitter and clear glue and paint small amounts onto certain shamrocks on the napkins and all over the large green shamrock. 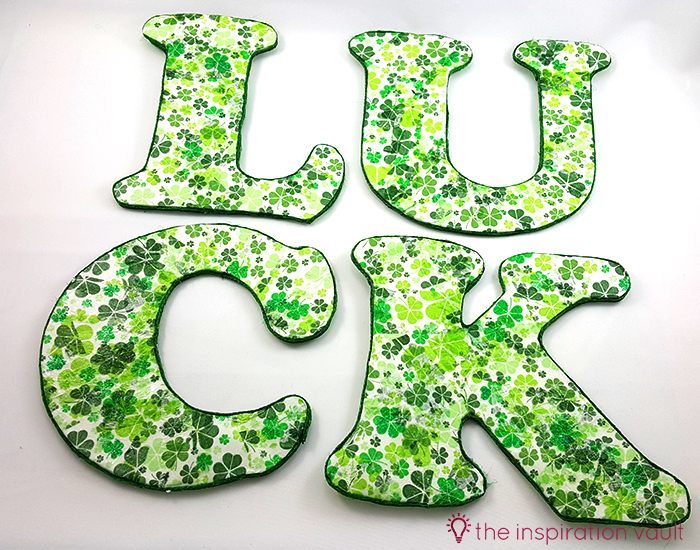 I chose one particular shade of shamrock and then painted glitter onto just those. Let them all dry completely. 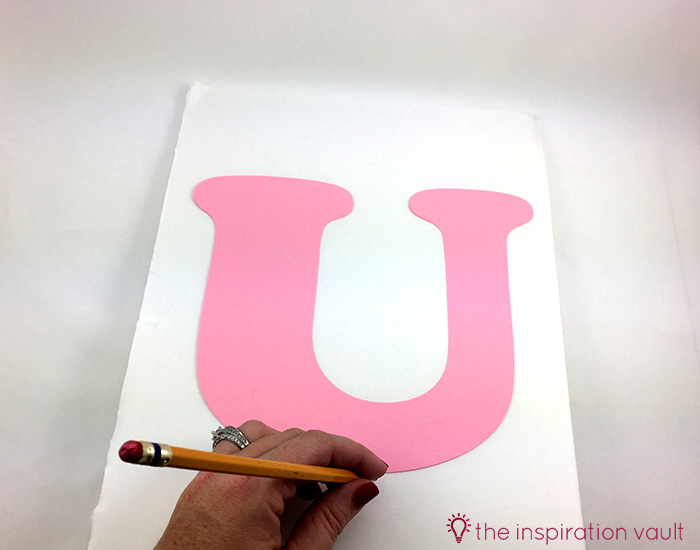 eight: Take the green jute cord and measure around the entire outside edge of the letter “L.” Then, cut a second piece the exact same length. Repeat for each letter. 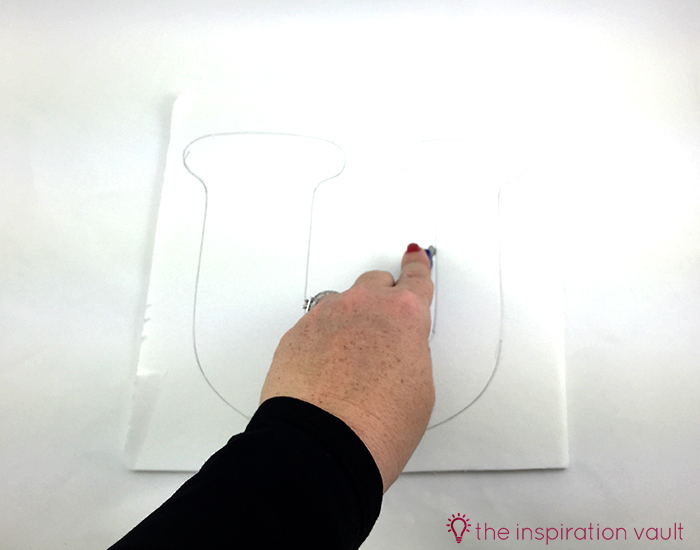 nine: Hold the two pieces of jute cord together and glue along the edge of the letter “L” with the clear tacky glue. Glue it in smaller sections to give it a chance to set a bit. I won’t kid you, this part can also get pretty messy! Repeat for each letter. Let them dry completely. eleven: Clip 10, 2-inch pieces from the wooden stirrers. 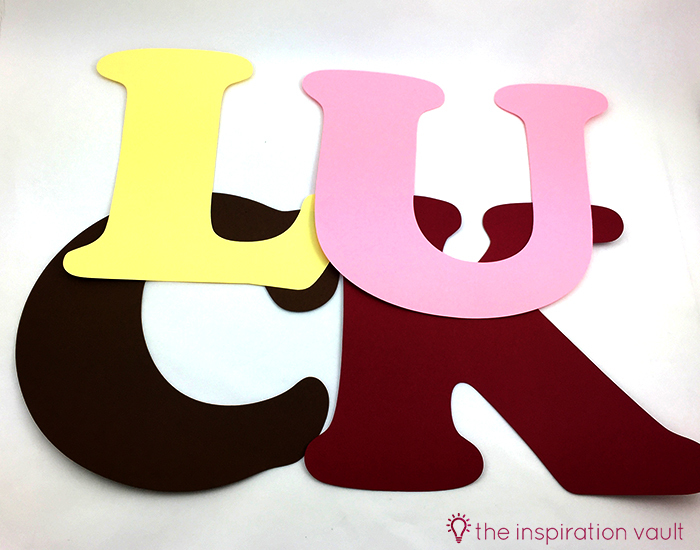 twelve: Glue the wood pieces to the letters as indicated in the photo to join the letters together. I ended up gluing two, side by side, for extra strength. 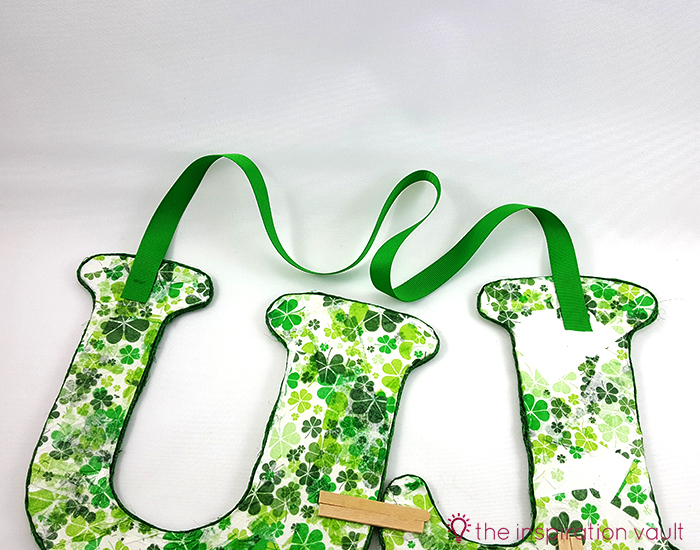 You can paint them green if you like your crafts to look nice on both sides. 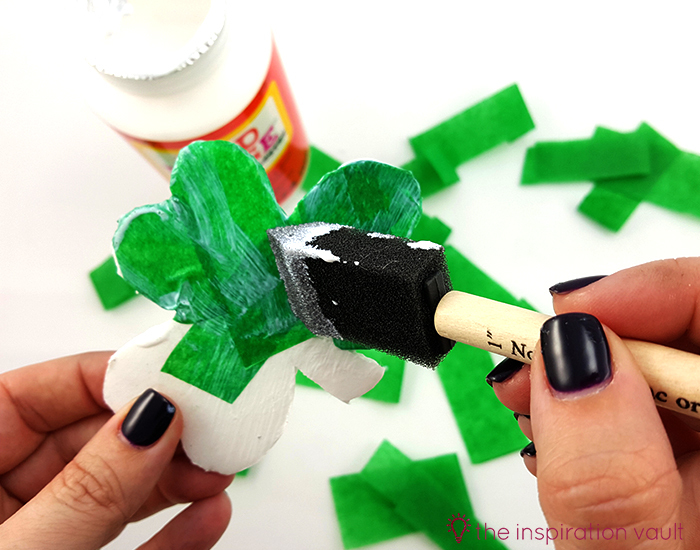 Be sure to let the craft sticks dry and set completely before you pick up the decoration. TIP: Sit heavy objects on the sticks to weigh them down while they dry, helping them to glue tightly. 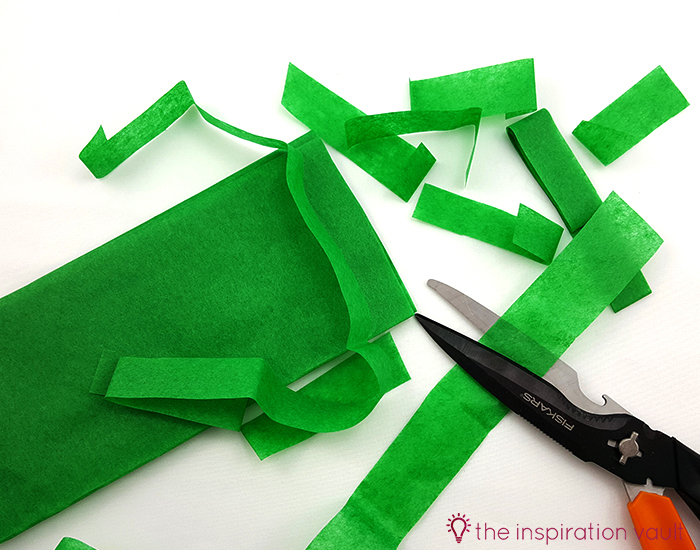 thirteen: Cut a 24-inch piece of green ribbon. Glue one end to the back of the “L” and the other end to the back of the “U.” Let the glue dry completely before picking up the decoration. If it’s too long for where you want to hang it, just tie a loop in the top. fourteen: Once dry, flip the decoration over. 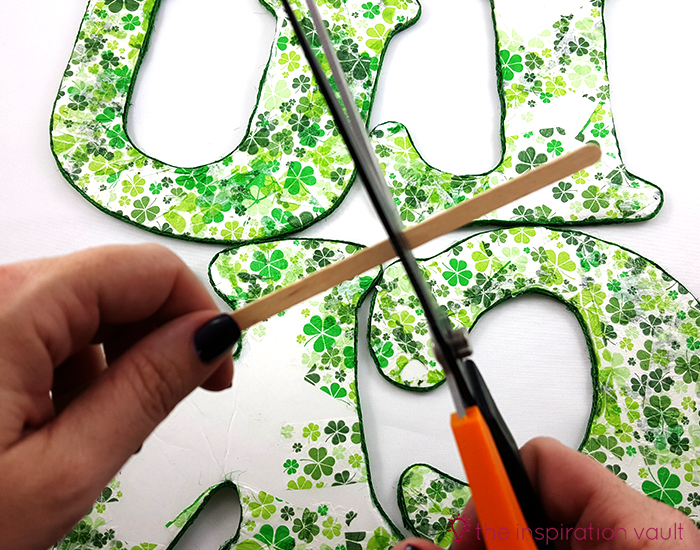 Glue the green shamrock to the center of the letters. I skewed mine slightly. 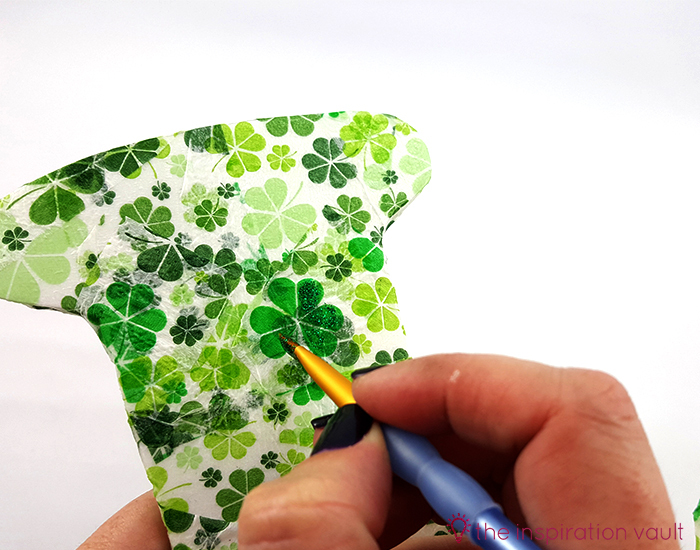 Let it dry completely before picking up the decoration or the shamrock will slide right off. Whew! So much glue! 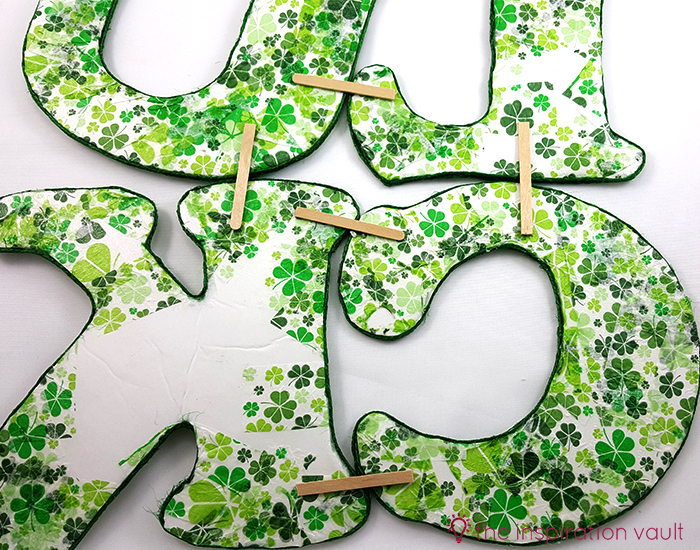 Really, most of my time making this Luck Shamrock Decoration was spent waiting for the different glues to dry. I didn’t use hot glue because it tends to melt foam board. For my first venture into decoupage, I think it turned out cute, though. 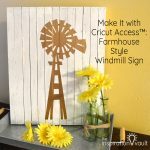 Now, don’t go looking at the fine details, but for a door or wall hanging, it looks great! 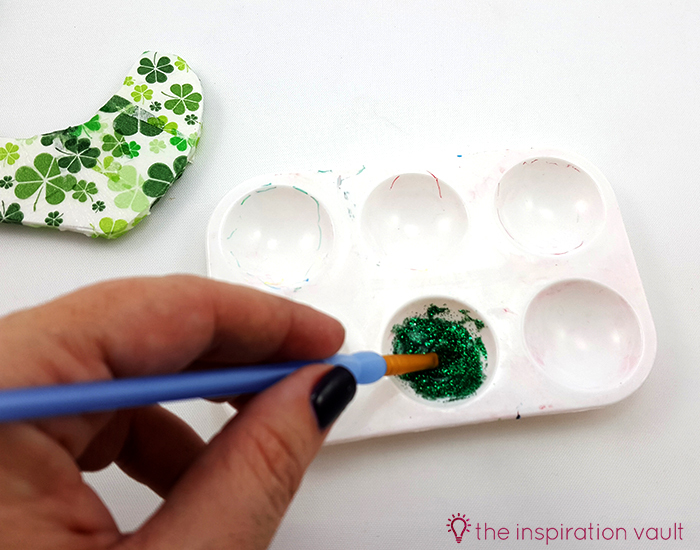 What was your first decoupage project? How did it turn out? 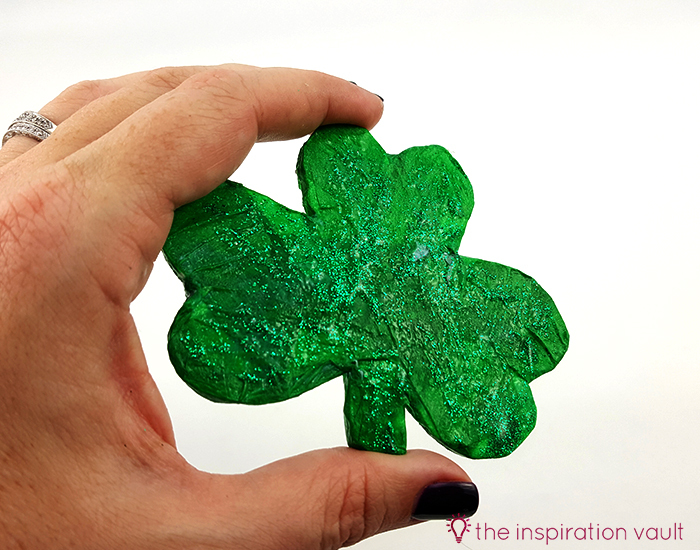 If you liked this craft, be sure to check out our other St. Patrick’s Day Crafts and our St. Patrick’s Day Inspiration board on Pinterest! 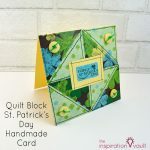 And if you’d like endless lucky craft inspiration, you have to see all of the St. Patrick’s Day Ideas over at All Free Holiday Crafts. Yes! Sign me up for access to FREE exclusive content. That is so creative! What a beautiful decoration.